Mic laid off 25 employees Thursday as the company restructures to shift its focus to video. 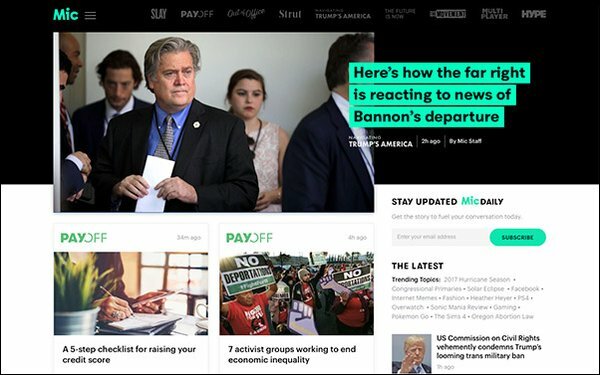 The move is another “pivot to video” strategy by a digital media company, which has spread across publishers like Vocativ (which laid off its editorial staff to commit to video-only) and Vice. “We made these tough decisions because we believe deeply in our mission to make Mic the leader in visual journalism, and we need to focus the company to deliver on our mission,” Mic cofounder and CEO Chris Altchek wrote in a memo to staff Thursday. Roughly half of the layoffs affected Mic’s newsroom, hitting reporters and editors, as well as employees on Mic’s audience and analytics teams. Mic said it will grow the company’s video team by hiring on-camera correspondents, producers and other visual journalists. But Talking Points Memo publisher and editor Josh Marshall disagrees. In a lengthy Twitter stream, Marshall said “pivot to video” is spin for publishers needing a new business model as expectations for digital advertising are not met. “No site is ‘pivoting to video’ because of audience demand. Not even close. They are pivoting to video because the industry is in the midst of a monetization crisis,” he wrote. In April, Mic raised a series C funding round of $21 million, bringing the company’s total funding to $52 million. At the time, Mic said the new funding will be used to expand Mic’s nine new verticals and video production.